Education is one of the most important investments a country can make in its people and its future. It is the core of human capital formation and central to development of a society. Investment in education and quality research at various national institutions are vital in achieving higher economic growth and reducing poverty and inequality. Quality education generates benefits to the society that go beyond the gains secured by the individuals involved. Similarly, research in science and technology (S&T) is of great importance and key to progress towards a knowledge-based and innovation-driven economy. It promotes better understanding on different aspects of life, and helps to improve the standard of living by generating new knowledge and technological innovation. 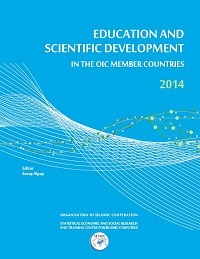 In this framework, SESRIC prepared the Education and Scientific Development in the OIC Member Countries 2014 Report, edited by Prof. Savas Alpay, which analyses and examines the trends in the major indicators in the field of educational and scientific developments in the OIC member countries. The Report investigates these trends in a comparative manner with their counterparts in the group of developed countries, non-OIC developing countries as well as the world as a whole. In so doing, the report highlights a number of constraints and challenges confronting the member countries in their efforts to foster their educational and scientific development. The Report consists of two main parts; one is on education and the other is on scientific developments. The first part of the Report covers important indicators of education, including, among others, average years of schooling, participation and progression in education, public expenditures on education, educational resources and teaching conditions, quality of education, and international student mobility. The second part of the Report is devoted to the scientific developments. It highlights the current stance of research and development (R&D) and S&T in the OIC member countries in terms of their average performance on some related indicators such as human resources in R&D, R&D expenditures, high technology exports, scientific publications and patent applications.